The effect on any kind of wildlife including squirrels depends on the natural instinct of the animal. 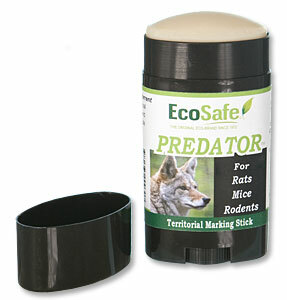 If the squirrels are naturally afraid of predators such as coyotes, then they may avoid the area. The only way to know is to test. Smear it on the door jambs, and mark any exposed wood by swiping it with the stick. If the squirrels avoid the area, then it works. If not, then they probably are not naturally "afraid". This is how predator scents work. Its all basically trial and error.